February 14th has long been regarded as the day of love. It is not just couples who have the chance to give one another gifts: It is increasingly common for people to take the opportunity to do something nice for friends and family members. That is a good reason for online retailers to spruce up their own shops with some targeted marketing efforts. 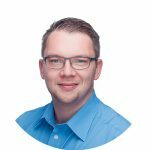 In this article, we show you how to do this and explain why it’s also worth doing for retailers who don’t sell traditional Valentine’s Day products. Of course, articles such as flowers, jewellery, confectionery, perfumes and experience gifts continue to exert the greatest attraction on Valentine’s Day customers. 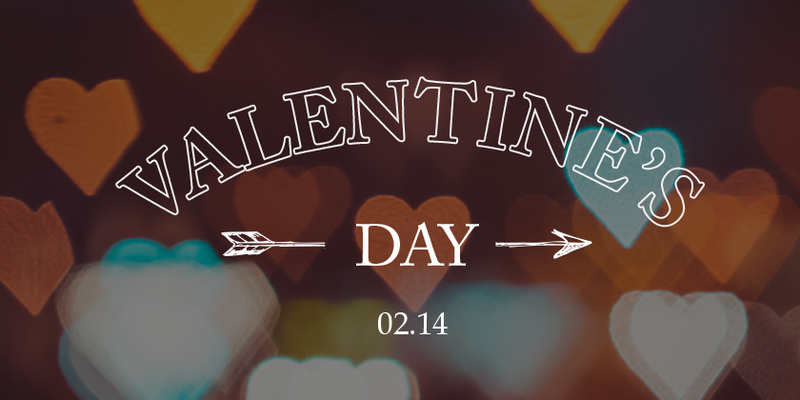 However, even if your own products don’t easily fall into these typical categories – with a bit of imagination, many retailers can still record better-than-average sales on Valentine’s Day. Your options here include providing customers with additional services, such as product personalisation with a choice of gift wrappings or individual greetings cards. This enables products like sneakers or Blu-rays to get a romantic touch – thus increasing the probability of a purchase. You should also place products that would make good presents in a topic-based category – such as “Valentine’s Day Gifts”. Visitors to the shop can then head directly towards all the gift ideas and get a good overview of what is available – and then buy more than they originally planned on doing. FACT-Finder allows you to easily create occasion-related categories with a feedback campaign: You first define the time frame for the campaign. You then define how it is triggered – in this case, category selection. Finally, you determine which product set, banner and text are to be displayed above the product results. And that’s your Valentine’s Day page ready to go. A tip: To steer more traffic towards it, link this page to your AdWords campaigns. Quickly create an inspirational Valentine’s Day category. The feedback campaigns from FACT-Finder help you to put your products in a position to generate more revenue. 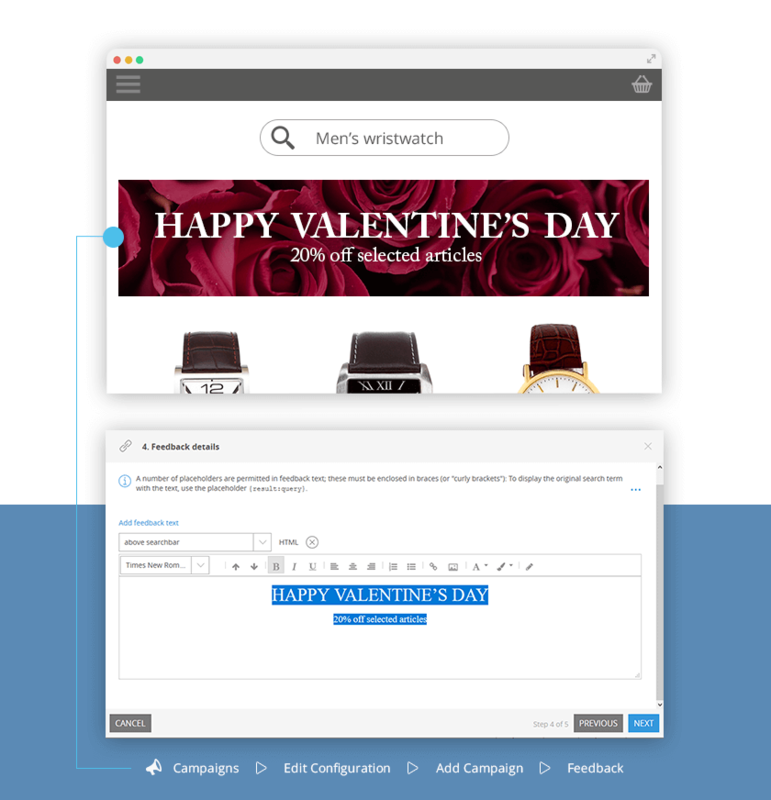 Mentioning your Valentine’s Day category in the suggestion menu will help to increase awareness of it among visitors to your shop. 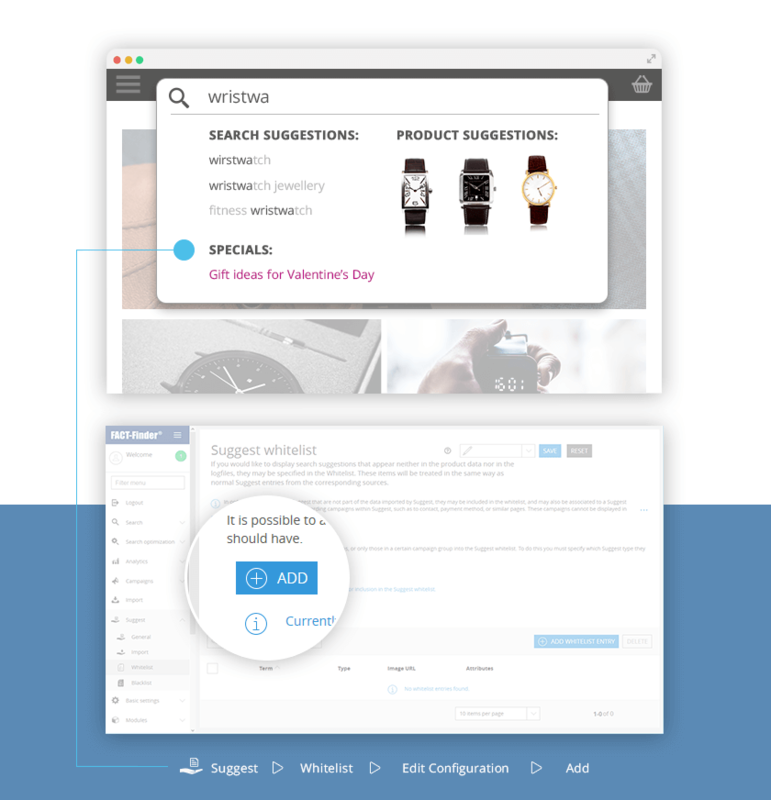 In addition to the actual search suggestions, FACT-Finder users can also display search suggestions for redirection campaigns while visitors are entering their search terms. To do this, you just need to add a new Suggest category in the backend. You will then be able to create a whitelist entry, to integrate redirection to your Valentine’s Day page into Suggest. It will then appear whenever a user enters a term that matches a product from your Valentine’s Day category. Visitors to your shop might still be undecided about which gift to choose. You have the opportunity to prevent them from clicking their way randomly around the shop and then leaving: you can use an advisor campaign to help out with targeted questions, like an experienced salesperson. The most suitable products can then be displayed automatically, based on the answers provided by the visitors. 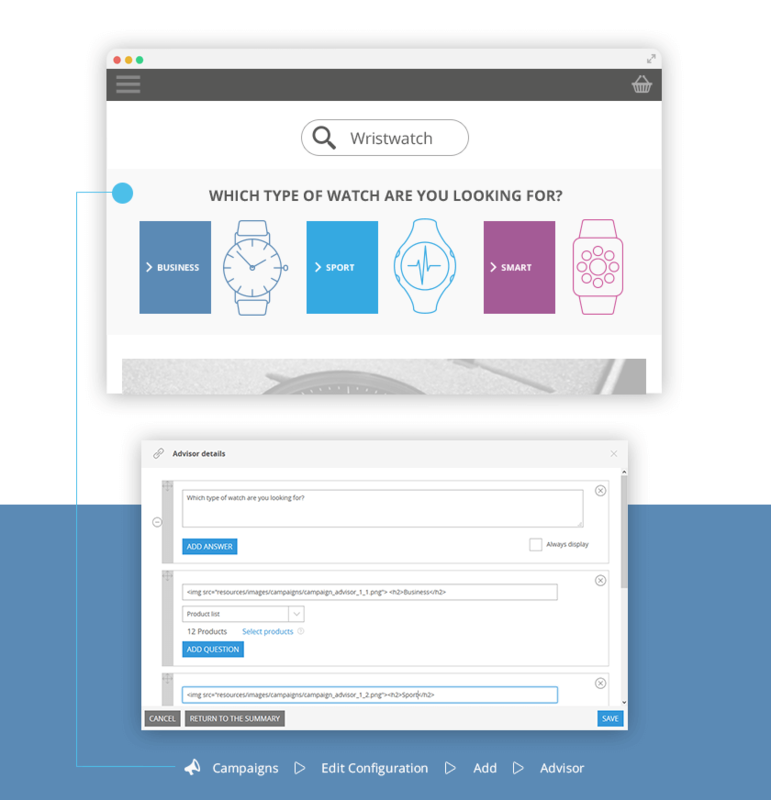 With some forward planning, you only need a few minutes to create an advisor campaign with FACT-Finder: Once you have selected the “Advisor” category in the backend, you can define the prerequisites for the appearance of your campaign (a specific search term, for example). You then just need to create your question-answer tree, by defining which answer matches which product results. If you have some suitable graphics, you can use these to visualise answer options. A helping hand for shoppers. You can use an advisor campaign to help indecisive customers find the right gift, and to increase your conversion rate. On special occasions, it can also be worthwhile to include new extra articles in your assortment for a short period of time – such as chocolates or flowers. These often generate good margins. Typically, you use products like this for cross-selling by positioning them on the detail pages for those products that would be ideal as Valentine’s Day gifts. How can you do this with FACT-Finder? If you use the Recommendation Engine module, you will see the “Manual Recommendation” menu item in the backend. This is where you can specify exactly which extra presents are to be recommended for which products. 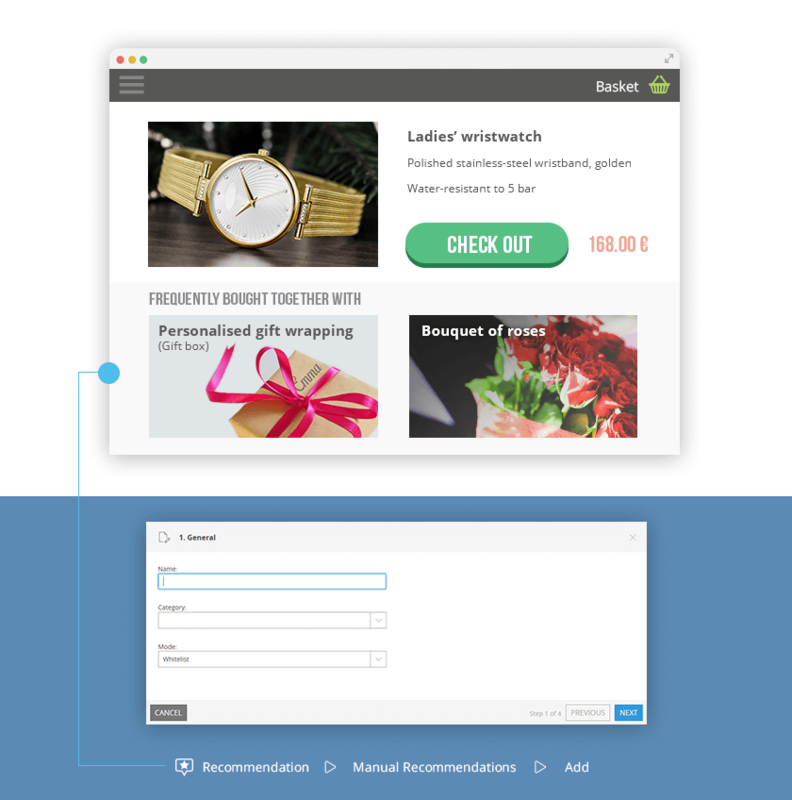 Increase cross-selling: Under “Manual Recommendations” in the FACT-Finder backend, you can make specific settings for the extra articles and the products for which they are to be offered. Clever on-site marketing can make 14th February a profitable day for retailers that do not sell traditional Valentine’s Day articles. Many online shoppers buy their gifts at the last minute – if your gift ideas encourage spontaneous purchases at an earlier stage, so much the better. Making the offers easy to find is the key. Ensure that your Valentine’s Day offers are positioned in the most visible locations – that also holds true for discounts on vouchers or selected articles. Informative article and definately a worth reading article for the readers who are into this. This is the time when we should represent the best in the most happening way. I have seen some of the sites that are working on such collection. Keep posting something useful like this.